Today’s focus is another of my very favorite yarns, the delightful Madelinetosh Pashmina. This sport-weight blend of 75% Merino, 15% Silk and 10% Cashmere is surprisingly versatile. It handles lace, cables and texture stitches with ease, and makes any project more delectable to knit – somehow, those Pashmina projects always finish so quickly compared to the others. In fact, I will assert that if I had to knit with just one yarn for the rest of my life, it would be Madelinetosh Pashmina. A bold statement indeed! The many faces of Pashmina, all knitted on a US 4/3.5 mm needle. This vibrant shade shows off a fun little lace stitch. 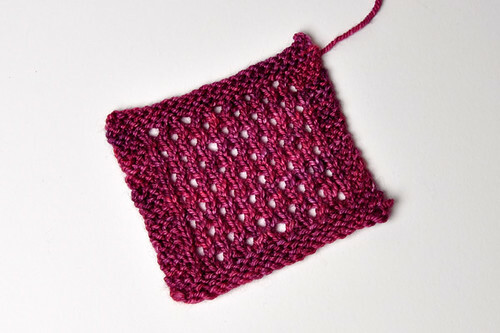 I think this stitch pattern would make a great lace detail on a garment or even a little headband. Pashmina also takes the dye so differently than the other tosh yarns – the silk content in the yarn makes those skeins glow, beckoning knitters from across the room. Semisolid colors like this Lepidoptera look great in Pashmina, as the margins between shades are very soft and blended. I cannot resist these elegant colorways and I often find myself adopting the last orphaned skein from a lot. Since the yardage is a generous 360 yards, it is possible to make a complete project from one skein. The above swatch was knit with my ample leftovers from a Scroll Lace Scarf and I knit an Ishbel from one skein, with 90 yards to spare! For a project using a stitch pattern similar to these playful dots, check out OlgaJazzy’s new Mizutama Shawl. It would be so dreamy in Pashmina! 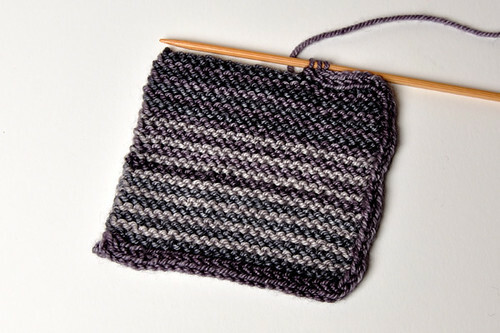 I made this swatch to try out my latest stitchionary acquisition. The light silver Smokestack colorway shows off the textured rib beautifully. I have been dreaming of making a tailored, textured vest for some time, and I think this may be the perfect stitch for it. It is soft and silky but the wool content gives it structure. A textured stitch like this one gives the already luxurious Pashmina a refined edge. This stitch pattern reminds me of stylized tree bark, and the gorgeous Terrarium colorway really plays up the natural effect. 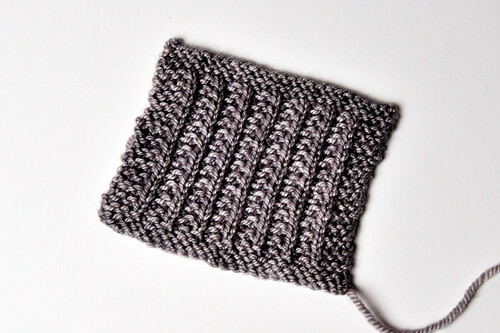 The plump stitches make great cables, subtle and smooth on the stockinette background. A stitch like this could inspire a splendid pullover – soft and warm, but not too heavy. I’m pretty sure I could live in a sweater like that! This swatch is a color study for what will become possibly the most posh Baby Surprise Jacket of all time. I discovered all these gorgeous shades of grey in my stash (surprise!) and I think they are so interesting together. The Composition Book Grey, used here in the applied i-cord edging, becomes more lavender/purple when juxtaposed with the cooler tones of Smokestack and Charcoal. The stitches are bouncy and stretchy, perfect for warm yet elegant baby winterwear. Even better, Pashmina is machine washable! Pashmina is truly a dream to work with. If you haven’t tried it before, treat yourself to a skein! You won’t be disappointed. But watch out- you might become hopelessly obsessed, like me! I hope you enjoyed my enthusiastic ravings about Madelinetosh Pashmina. 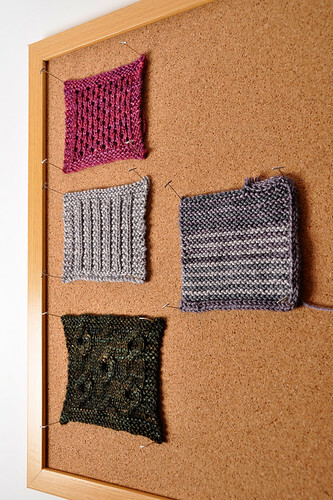 Next week, we will explore some yarn combinations for a mysterious 4-armed sweater from Habu Textiles! 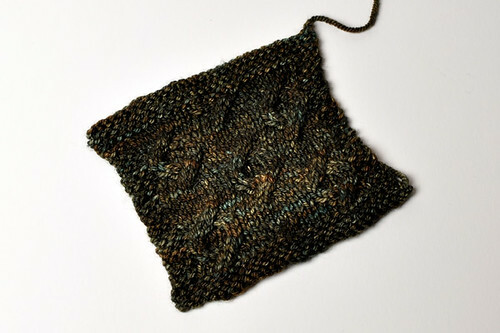 The post Swatch Watch: Pashmina Parade appeared first on Knit Purl Blog.